On 21 September, winners of the Science Council’s CPD Awards were invited to a ceremony generously hosted by CIWEM in London to celebrate their achievements. Science Council Chair, Professor David Croisdale-Appleby, presented winners with their certificates and each winner delivered a short presentation about the impact that CPD and professional registration has had on their career. Awards announced on the night are listed below. This is the first year that nominations for the CPD Awards have been opened up to self-nominations and it is the first year that judges from outside the science sector have been involved in the judging panels. Our two external judges: Richard Williams from the Solicitors Regulation Authority and Simon Bowen from the Chartered Management Institute brought a wealth of CPD expertise from their respective professions. 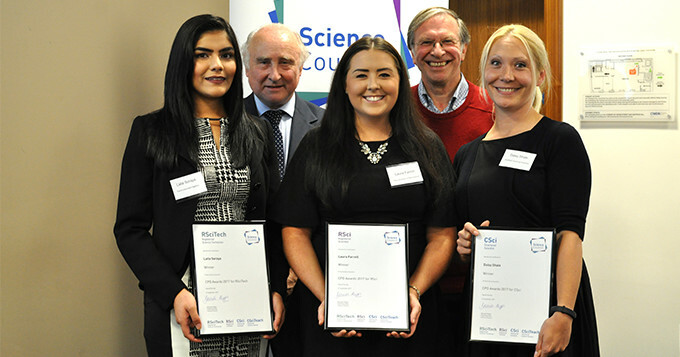 Photo (L-R): Laila Soraya RSciTech; Professor David Croisdale-Appleby, Science Council Chair; Laura Farrell RSci; Trevor Lewis, Chair of the Science Council’s CPD Learning Group; Daisy Shale CSci.